Chairs by Studio Massaud combine to form benches in reception. 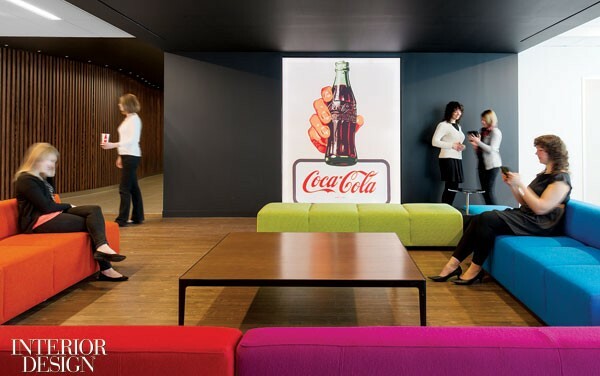 Chairs by Pearson Lloyd gather in the reception area of the Canadian headquarters for the Coca-Cola Company. For the past 32 years, my mother has been involved with the Coca-Cola company. She currently holds a position as an analyst with Coca-Cola and their Minute Maid brand. I met with her at her workplace yesterday before we hit up the Toronto Raptor's game. While waiting for her to finish, I explored the new office space located at 335 King St. West. The location is actually pretty sweet. It's right on the busy and lively streets of King Street, packed with culture, good eats and great shops. It's also walking distance to the Historic Distillery District and St. Lawrence Market. The newly renovated space is a three-story glass addition, including a street-level reception area, built above the red brick Toronto Sun newspaper building. Figure3 Interior Design, designed the 105,000 square foot modernized space for a staff of 400. Umbra, Unilever, and Warner Bros. Entertainment also took part in the architectural branding. 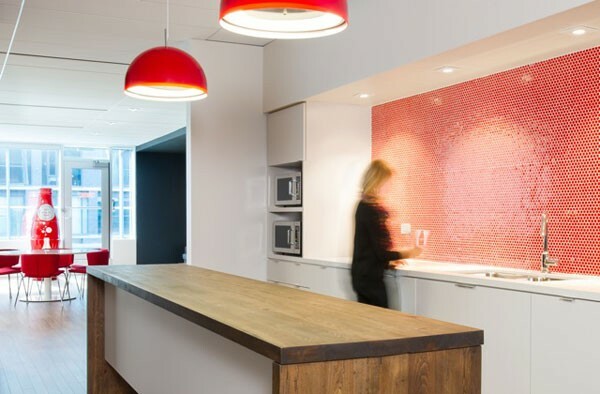 Upon arrival, you enter the reception area which caters to clean lines, warm wood tones, white walls, Coca-Cola murals, pops of vibrant red and organic use of materials. For instance, the first set of chairs are by designer, Pearson Lloyd and the second by Studio Massaud who combine wood and steel to form bench-like seats in reception. In an elevator lobby, a logo carved into quarter-sawn Douglas fir paneling complements a hanging made completely from Coca-Cola bottle caps. The red and silver bottle caps are linked Paco Rabanne chain-mail style, and each of the Navy 111 chairs in the cafeteria lounge is made by Emeco from 111 recycled PET plastic Coke bottles. Talk about real organic material why don't cha! At the centre of the three main levels, an atrium brings in natural daylight that accents well with warm grey, cozy round sofas designed by Alison Spear, which tend to form conversation circles within the open space. When cleared of lounge furniture, the space occasionally serves as a town hall for company-wide events. The artrum is also surrounded by boardrooms, meeting rooms and private telephone booths. One side of the atrium space showcases a creative mural of a Coca-Cola delivery truck that starts as paint on gypsum-boards and ends as vinyl film on the glass front of a private telephone room. This gigantic mural pieces serves as a vertical billboard that combines backlit digital photography with an LED video screen for motion graphics. Talk about cool and high-tech! When leading toward the office areas for the different beverage brands, you'll notice short hallways that bring you into a different space in time or different zones, so to speak. Figure3 designed these installations to give a "bigger picture." 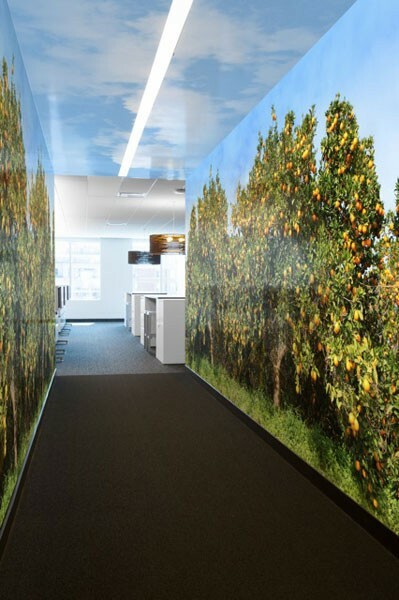 For instance, when you enter Minute Maid's portal, you have a hallway mural of a realistic looking orange grove with ripe oranges hanging from trees, bright skies and fluffy clouds for the ceiling. The Coca-Cola hallway gives you a blurred, dizzy mural effect as a blurred line-up of Coke cans give the illusion that they're passing by you 100 miles per hour. Kind of like when a train passes by. For Vitaminwater, imagine its bottles elongated to become rainbow stripes sprinting up a wall, across the ceiling, and down the opposite side. Trippy, huh? A Coke-red portal turns the brand’s famous ribbon into an enormous time line dotted with Coca-Cola's milestones, starting in 1886 in Atlanta. Awesome way to visually learn about its history! As added bonuses, Coke provides unlimited free drinks at its high-tech fountains; has a gorgeous open patio balcony space with the city view; a to-die-for kitchen with high-end appliances; beautifully finished hardwood tables; and Coca-Cola hockey foosball tables for when you need a little break from your desk! Awesome, fun space to check out if ever you get a chance! Sofas by Alison Spear form conversation circles in the central atrium. Cool writings on the wall help with brainstorming. Coca-Cola’s time line starts in 1886 in Atlanta. Minute Maid’s portal has a mural of an orange grove. A mural of a delivery truck starts as paint on gypsum-board and ends as vinyl film on the glass front of a telephone room. In a lounge, sofas by Eoos surround a table by Cory Grosser Design + Strategy. Vitaminwater bottles suggested the stripes for a hallway to a break-out area. Global Imaging: Graphics Consultant. PPG Industries: Paint. Westbury National: Audio Visual Consultant. Green Reason: LEED Consultant. Engineering Link: Structural Engineer. Smith+Andersen: MEP. Ell-Rod Holdings: WoodworK. MARANT Construction: General Contractor.